The apartment is located in the trendy area called 'Sofo' on Södermalm. The property is from 1932 and has a high standard. 2 min walk to the subway and the bus. The area has lots of cafes, restaurants, shopping and entertainment nearby. Walking distance to Old Town (1800 meters) Walking distance to most attractions in Stockholm Close to picnic spots and views of Stockholm. We provide bedlinen and towels. The apartment was perfect for our stay in Stockholm. The location is convenient for travel all over Stockholm. It is comfortable and very clean. We got so lucky finding this place. Stockholm is such a beautiful city and so easy to get around. This apartment was perfectly located in Soldermalm with such great choices of restaurants, shopping and either a mile walk to Gamla Stan or a few blocks to the subway. We did both (walk and subway) regulary. Didn't seem to be a huge tourist area, which made it even more fun and more reasonable for eating. Really fun place. The apartment itself was perfect for my daughter who just graduated from university and me - one bedroom with a Murphy Bed in the living room. Everything we needed in the kitchen - plus a grocery store a short walk away - so we saved money that way as well. Very reasonably priced. I have a dream that someday my husband will just pick a place after we retire and live for a few months in a wonderful European city and we would pick this place in a moment if it were available for that! Highly recommend! Location of the flat is amazingly good, great for 4 people, well equipped and very easy going host. Super convenient arrival and departure! Thanks a lot, it was a big pleasure to stay at your place Urban&Veronika! The apartment was very nice and worked perfectly for us. It is very attractive and well equipped. It is also very convenient to a busy shopping area and to public transportation to the Gamla Stan. The only problem was the bed is a little low compared to what we are used to. I have long legs and it took a bit of getting used to the height. Other than that it was very nice and we very much enjoyed our stay in Stockholm. The apartment is spacious and comfortable, filled with light from its many windows. It's the perfect place to stay. And the location is a fun one to explore (Sodermalm) while being very close to everything else to see in Stockholm. Urban is a thoughtful and helpful host -- he explained everything in the apartment & building to us (such as laundry, which is on the ground floor for the building) and he even booked a taxi for us. The hardest part was leaving -- Stockholm is beautiful and we had a great time! 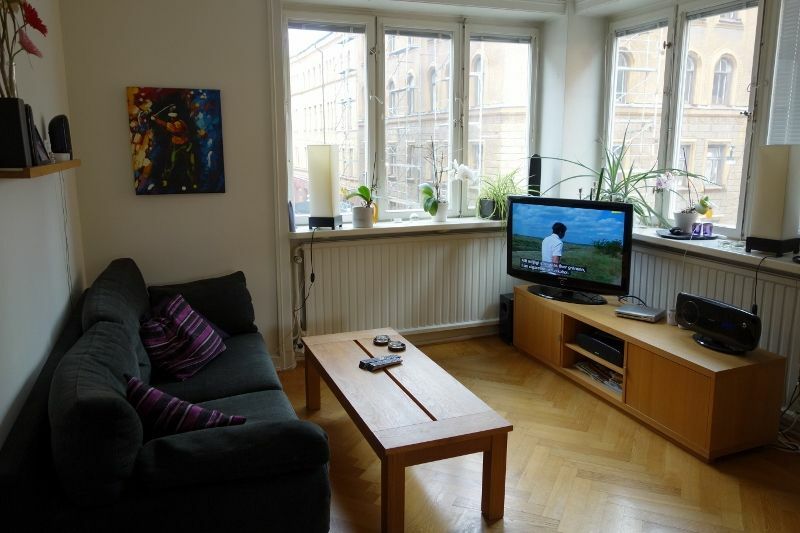 The apartment is located in the trendy 'Sofo' on Södermalm. The property is 1932 high standard..2 min walk to the subway (Civic Square) and the bus. The area has lots of cafes, restaurants, shopping and entertainment. Walking distance to Old Town. Walking distance to most people the attractions of Stockholm can offer. A fresh top accommodation!